Hawaii's Jared Dillinger put up a shot over Nevada's Armon Johnson in the second half of last night's game at the Stan Sheriff Center. Nevada's recent mastery of its series with Hawaii continued last night, as the Wolf Pack scored a 77-59 win over the Rainbow Warriors at the Stan Sheriff Center. Wolf Pack guard Marcelus Kemp scored a season-high 29 points and Nevada capitalized on a cold shooting night for the Rainbows to beat Hawaii for the seventh time in the last eight meetings. 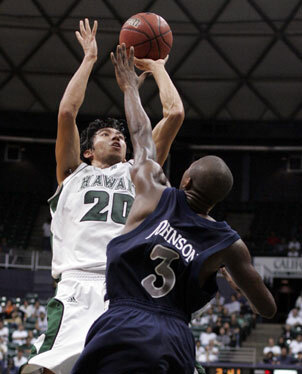 Matt Gibson led the Rainbows with 22 points, but the rest of Hawaii's lineup struggled. UH, coming off two solid offensive performances on the road, shot 37.5 percent from the field in its return home. The Rainbows went 3-for-21 from 3-point range, including 1-for-12 in the second half. Hawaii actually led early, opening up a 12-point advantage in the first half. But Nevada outscored the Rainbows 28-6 from there to take control. Hawaii's three-game homestand continues tomorrow against San Jose State. Tip-off is set for 7:05 p.m. at the Sheriff Center. 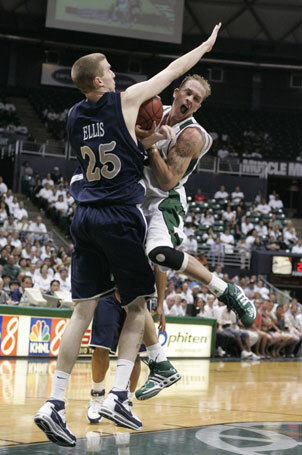 Hawaii guard Matt Gibson ran into Nevada center David Ellis while driving to the basket last night. Gibson scored 22 points. Nevada began its road trip in icy Reno, but it was Hawaii that suffered through a frigid night in a 77-59 loss to the Wolf Pack last night at the Stan Sheriff Center. Coming off two solid offensive performances on the road, the Rainbow Warriors struggled to a 37.5 percent shooting night in their return home before a crowd of 4,257. "It was a nightmarish night," UH coach Bob Nash said. The Rainbows dropped to 5-10 overall and 1-2 in WAC play going into tomorrow's game against San Jose State at the Sheriff Center. With three of Hawaii's top four scorers struggling with their shots, Matt Gibson represented the bulk of the Rainbow offense, scoring a team-high 22 points. But it wasn't enough to offset a cold night overall or counter Wolf Pack guard Marcelus Kemp's season-high 29 points as Nevada continued its mastery of the series of late, beating Hawaii for the fourth straight game and for the seventh time in eight meetings. Bobby Nash, UH's leading scorer entering the game, Riley Luettgerodt and Jared Dillinger scored a total of four points through 35 minutes of the contest and shot a combined 6-for-21. As a team, the Rainbows went 3-for-21 from 3-point range, including 1-for-12 in the second half. "It was like a road game tonight in the sense that we didn't get to shoot a lot in our own gym," said Gibson, alluding to the fact that the team didn't practice in the Sheriff Center this week until yesterday's shootaround due to volleyball occupying the arena. "It just came down to our shooters missing a couple of jump shots. It doesn't happen too often and I'm not worried about it. We'll be ready for Monday." Bobby Nash finished with eight points, ending a streak of 19 straight games in double-figure scoring dating back to last season. None of the other Rainbows scored more than six. "We didn't play with the same energy and the confidence that we did on the road," Bob Nash said. "I thought our shooters were a little tentative on their shots and as a result we didn't shoot a very good percentage. When that happens there's a very thin line of success." Kemp led four Nevada players in double figures. Brandon Fields finished with 14 and freshman Armon Johnson had 10, while center JaVale McGee posted 10 points and 12 rebounds. But it was Kemp who sparked the Pack, scoring seven of the team's first nine points to open the second half as Nevada rebounded from a loss at San Jose State on Thursday to earn a split of its road trip. "He made his teammates better and when he needed to make plays he made them," Nevada coach Mark Fox said. "Tonight he was very, very good." "(Hawaii) didn't shoot it well, but after the (slow) start we played really well. We played much more mature than we've been playing." The night actually started promisingly for Hawaii as the Rainbows opened a 12-point lead in the first half until the Nevada offense, stagnant for much of the first 13 minutes, got rolling. Gibson scored 10 points in the first 12 minutes and UH led 22-10 when P.J. Owsley picked up a loose ball and scored on a reverse layup. The Wolf Pack took off on a 17-2 run bookended by 3-pointers by Fields to move ahead 27-24. The Nevada comeback coincided with Fox's decision to put more size on the court after starting a smaller group. "Whenever you have a 7-footer (McGee) in the lane who can block shots it changes the game so much," Gibson said. "The guards are able to read the passes more because they know you're not going to drive in there and try to shoot up over those guys." Nevada led 31-28 at halftime, and the Wolf Pack run reached 28-6 when Kemp hit a 3-pointer and scored on a putback early in the second half to give Nevada a 38-28 lead. "I was just taking what the defense was giving me," Kemp said. "I saw some open lanes, made a couple open shots and it got me going. ... We just stayed with the offense and took the shots the defense was giving us." The Rainbows drew to within four at 42-38 with 13:17 left, only to see the Wolf Pack pull away again as a dunk by McGee sparked a 10-2 run and Nevada cruised down the stretch. San Jose State at Hawaii, 7 p.m.
3-point goals -- Nevada 7-15 (Kemp 3-6, Fields 2-5, Cooke 1-1, Kraemer 1-1, Burleson 0-1, Johnson, A. 0-1), Hawaii 3-21 (Gibson 3-7, Mayen 0-1, Luettgerodt 0-2, Dillinger 0-5, Nash 0-6). Personal fouls -- Nevada 18, Hawaii 18. Steals -- Nevada 3 (McGee, Kemp, Johnson, D.), Hawaii 5 (Gibson 3, Luettgerodt, Nash). Blocked shots -- Nevada 3 (McGee, Kemp, Johnson, D.), Hawaii 3 (Amis 2, Owsley). Turnovers -- Nevada 19 (McGee 6, Kemp 4, Johnson, A. 3, Johnson, D. 2, LaGrone 2, Fields, Burleson), Hawaii 13 (Gibson 6, Luettgerodt 3, Mayen 2, Dillinger, Nitoto). Officials -- Mike Littlewood, Larry Spaulding, Shawn Lehigh. A-- 6,312.